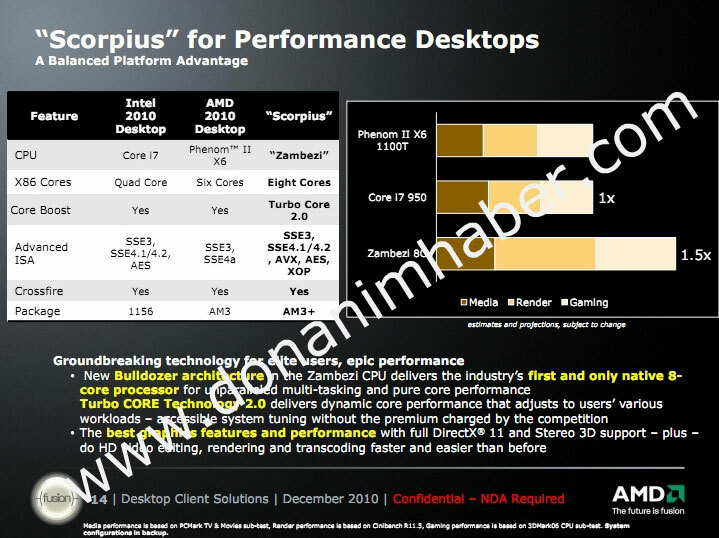 Here is one another benchmarks graph of the AMD upcoming Zacate processor, as from Donanimhaber. A truckload of salt is required. According to the leaked slide, AMD Bulldozer outperforms Intel’s core i7 950 and Phenom II X6 by around 50% in gaming and rendering and is slightly better in media benchmark. It should be noted though in this benchmark its a bulldozer Octocore not a Quadcore. by definition one integer core is one core learn to IT, also it _SAYS_ ZAMBEZI 8C on the slide learn to read to. The motherboard listed on the chart is a 1156, but the fastest CPU on the 1156 motherboard is the Core i7-870 or 860S.